When it comes to quiet, clean and reliable energy – nothing beats the PowerTap 2000 for all of your mobile power supply needs. In or out of doors, bring clean, silent 2000 watt power to your next project. 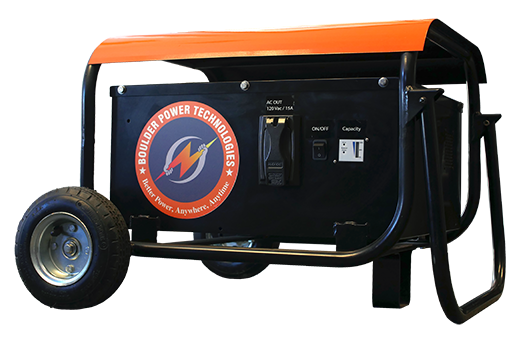 Representing the next generation in portable energy, the PowerTap 2000 utilizes cutting-edge battery technology to deliver the power you need – where and when you need it – with “Zero-noise/Zero-emissions,” and without the mess and cost of gas powered generators. Durable, mobile and as easy to use as a standard electrical outlet, the PowerTap 2000 is perfect for powering any device – from event electronics and back-up for home appliances to a wide range of construction power tools. The PowerTap 2000 is the better source for portable power! Boulder Power Technologies develops next-generation portable energy solutions that are clean, easy-to-use and 100-percent silent for a range of mobile power needs. Experts in Lithium Ion battery innovation, the company’s portable power systems – designed and manufactured in Boulder, Colorado –provide renewable, efficient and uninterruptable energy to construction, outdoor/entertainment, mobile business and facilities/event applications. The company’s mission is to introduce “better” portable energy – blending durability, reliability and simplicity into battery-powered systems that are more versatile, cost-effective and eco-friendly than traditional, gas-powered generators. Size: 2’ Height x 4’ Length Weight: 100 Lbs.